Art is not always easy or even pleasurable, but some artists are born with a passion in their souls that draws them to create, regardless of the cost or tribulation. 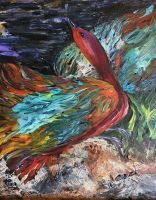 And so it is with Coco Sweezy, whose art reflects this passion for creation in its mixture of mediums and dynamic colors and textures. 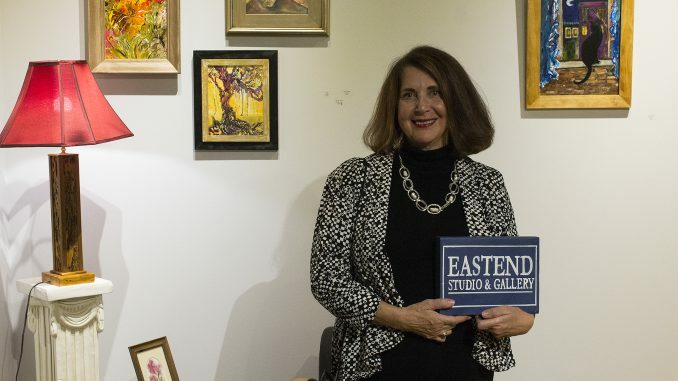 Many of Sweezy’s acrylic paintings are on display in her exhibit “Welcome Home” at the EastEnd Studio & Gallery in Marshall, Michigan, until Dec. 23. The exhibit it free to the public. Sweezy recently moved from Kalamazoo to Marshall, Michigan. The title of the exhibit, “Welcome Home,” is in honor of this move. Sweezy was always surrounded by art while growing up in Mexico. Her mother was an artist and taught her how to paint at a young age. When she got older, Sweezy studied art at a university in Mexico City. After graduating, she taught art history for a time in Mexico. Later, she moved to the United States to get a master’s degree in economics. Though she branched out from art during this time she never left it behind, creating art in her free time as she taught part-time social science at colleges near where she lived. After retiring, she began to dig deeper into her passion for art, having felt its call throughout her life. For many years she had her own gallery in Vicksburg, Michigan. Sweezy utilizes brilliant colors in her paintings that are inspired by her Mexican heritage. Also drawn from the artistic style of Mexico are the flowers, gardens, and tropical birds that often adorne her works. She most often paints what she sees, whether this be in her mind’s eye or what is physically around her. So, her paintings can just as easily depict Great Lake beaches and lighthouses, many varieties of architecture, and Midwestern landscapes as it can harken back to her Mexican roots in its bold colors and floral subjects. “Everything I see will impact me in different ways, and then there is a mixture of memories and culture that helps me in different ways,” said Sweezy. She uses a number of different mediums, although the “Welcome Home” exhibit is composed mainly of acrylic paintings framed in custom frames mostly made or restored by Sweezy herself. Sweezy often seeks out old frames to restore for pieces and has done paintings on many materials including canvas, wood, and metal. Many of her paintings are also collages. She uses fabrics or materials like eggshells and flower stems to add depth and texture to her art, often blending these elements into the work with layers of acrylic paint. She also works with pastels, inks and watercolors. Sweezy is dedicated to the vision of her art. For example, an acrylic collage of a lighthouse landscape that is now in the gallery had to be painted in many different forms before she found the right one. So she would return time and time again to the place she wanted to paint to get it right. It was a creative and experimental process which took place over the course of two years even though the final painting itself took hardly any time at all. “That lighthouse I did in pastel, in ink, in this and that, until I found the one I liked. But I did it more than once, and in different media, until I found the one. And finally acrylic was the one. I did it watercolor, I did it in pastel, and the acrylic was the one I liked… And sometimes some things work in two minutes. It’s not so much what it takes to put the paint on it but the composition, the creation, the concept and that’s what can be very different,” Sweezy said. Due to the vibrancy of the colors that Sweezy uses and the texture that she works into the piece, her work really is such that it must be seen in person. Unfortunately, screens and photographs simply cannot reproduce the color, texture, or shine of the paintings which make them so magnificent to look at. For such a reason, it is well worth the trip to Marshall to visit the EastEnd Studio & Gallery, curated and managed by Warner Ball (‘15). The gallery is located on Michigan Avenue, Marshall’s main street,own the block from the District Library and Schuler’s Restaurant & Pub. It holds regular art classes for both children and adults; a frame shop; and a wonderful array of purchasable art ranging from the college-student-affordable to the high-end. Allyson White is a sophomore from New Buffalo, Michigan. She is double majoring in psychology and English and minoring in anthropology. She is a major history buff and loves the humanities, literature (1500's-1800's literature, especially), and environmental science. She spends the greater portion of her time drawing/painting or working on her vegetable garden.